I can finally share this quilt with you! This is Noodles and it's in the current issue of Fat Quarterly magazine. Back sometime around the beginning of the year, I was sent a bundle of fat-eighths of Reel Time by Zen Chic for Moda to use to create a project for the magazine. The only requirement was that the project would feature curves, since that was the theme of the issue. I took on the project with no plan, and without actually being comfortable with sewing curves. Nothing like just leaping in, right? While waiting for the fabric to arrive, I made circles for Kim's Round Trip Quilt, to give myself some feel for sewing curves, and to see if it would jumpstart some ideas for what I'd design for the magazine. It worked (whew) and I had a plan once the fabric arrived. Cutting into the fabric was terrifying (which seems to be something I'm saying a lot lately) because I had just enough for what I wanted to do, and the fabric wasn't even available in stores yet, so if I made a mistake there was no chance of getting more. Thankfully there were no mistakes and the mini quilt, which finishes at 24" square, came together nicely. I added the solid yellow accent fabric from my stash. I took pictures and wrote the pattern, but then it just sat for days because I couldn't come up with a name for it! Zilch, nada, nothing! I sent a picture to my friend Michelle, who immediately sent back a message saying it reminded her of macaroni, so she suggested Noodles. Finally the poor quilt had a name! One day last week I saw that the issue had been published a few weeks ago, so I am happy to finally be able to show it to you. As you can see, I kept the quilting fairly simple. I used my walking foot to echo the curve in thread that matched the fabric. As always, I love the way the quilting shows up on the back. There, that feels better! No more secret quilt hiding around here...well, unless you count the one I just bought fabric for, which I won't be able to share until January. There will be sneak peeks, though, I promise! If you want to get your own copy of the Curves issue of Fat Quarterly (and the pattern for Noodles) it is available here. Congrats on being published. Noodles is such a fun quilt. Congratulations. It's a great pattern. 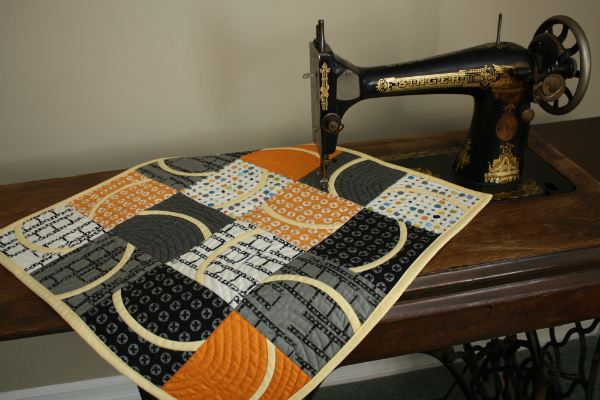 What a great mini quilt and congratulations! Secret projects are always so fun to be able to reveal! Congratulations on the publication!! How exciting. 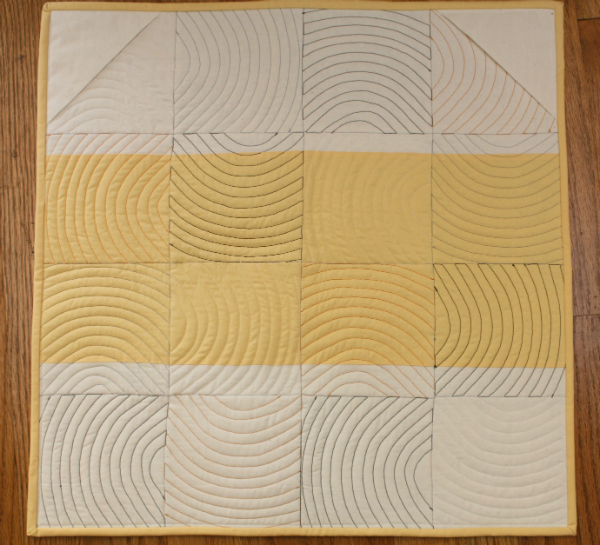 Love all the curves, especially on the quilting. Congratulations! Noodles is a playful design that works so well with those fabrics. Bravo, Leanne! This is so cool! Noodles is a fab name for it. Popping over to buy a copy now. Thanks for sharing! 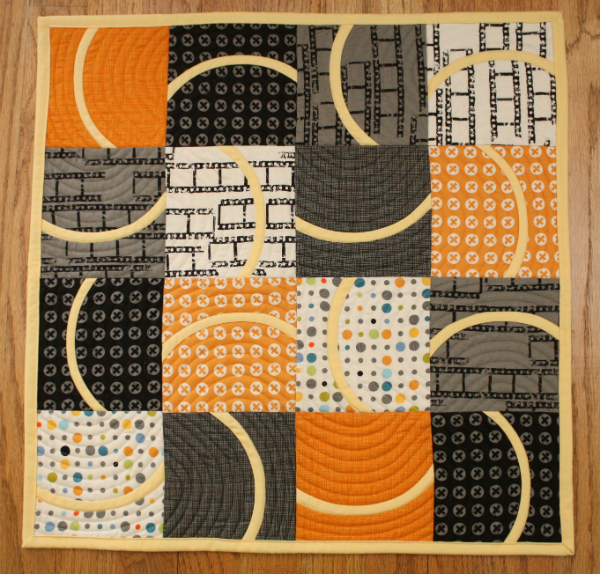 What a cute curve quilt!! Love the colors! Great quilt! I love the curves and the complimentary quilting.